Linksys has new home networking gear out today &mdash including the WRT100, a wireless router that uses MIMO (multiple input, multiple output) technology, and comes with Linksys' Easy Link Advisors, which apparently "takes the consumer on an uncomplicated, illustrated journey toward secure home network setup." And there's more than just a router in the RangePlus family: more info, prices and press release below. The $99.99 router is accompanied by the WPC100, a wireless notebook adapter &mdash also out today &mdash and a wireless PCI adapter and wireless USB notebook adapter, but these should be hitting shops sometime in the next quarter. IRVINE, Calif., - Sept. 20, 2007 - Linksys, a Division of Cisco, the leading provider of VoIP, wireless and networking hardware for the consumer and small business environments, today announced the debut of RangePlus, its newest line of home networking products. The RangePlus family of products is an affordable solution for consumers who are looking to extend the coverage of their wireless network. It includes the RangePlus Wireless Router (WRT100), RangePlus Wireless Notebook Adapter (WPC100), RangePlus Wireless PCI Adapter (WMP100), and the RangePlus Wireless USB Notebook Adapter (WUSB100). The RangePlus family uses Multiple Input, Multiple Output (MIMO) technology to provide greater wireless network coverage. MIMO utilizes signal reflections that can hinder performance in other wireless products to add range and reduce "dead spots" in the wireless network, enabling a wider coverage area. The WRT100 is designed to be teamed with the RangePlus Wireless Notebook, PCI, or USB Adapters, but can provide additional wireless network range when used with virtually any wireless adapter available today. "Until now, consumers who were seeking to increase the range of their wireless networks were required to use proprietary solutions that could not be used with other technologies or pay a substantial premium for products designed to do much more than they needed," said Mani Dhillon, director, product marketing, Linksys Consumer Business Organization. "With the launch of RangePlus, Linksys now has a full line of wireless networking options that allow the consumer to choose the solution that best meets both their desires and their budget, without sacrificing on either front." 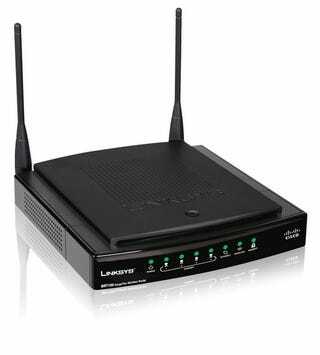 Linksys Easy Link Advisor (LELA) is included with the WRT100 to help consumers install and manage their home networks. LELA takes the consumer on an uncomplicated, illustrated journey toward secure home network setup without the need for knowledge of technical jargon such as "SSID", "MAC address", or "WPA". The user simply launches the application on their PC and follows the instructions to accomplish network maintenance tasks, including adding PCs, enabling security, and automatically mapping the newly created network. Devices such as network printers, IP cameras, or network attached storage, that may have been present on previously installed wireless networks can be easily migrated to the newly created RangePlus-based network using LELA. To further empower the consumer, LELA also includes troubleshooting tools and an easy-to-read list of all network information, including IP addresses and connection status. Both the WRT100 and WPC100 are available now through Linksys e-commerce resellers at estimated street prices of $99.99 each. The other RangePlus products will be available in the fourth quarter of 2007 from retail, direct response, and VAR partners.